Airbus also was hurt by interior supplier delays from Zodiac for its A350s. Boeing suffered from engine problems on the Rolls-Royce Trent 1000 that spilled over to new-production 787s. “Gliders” emerged from the assembly lines in Everett and Charleston as new engines were diverted to grounded 787s. CFM also failed to deliver LEAP-1B engines on time to Boeing for 737s, resulting in gliders at Renton. Spirit Aerosystems missed delivery schedules for about 15 737 fuselages. Bombardier also suffered from delays by PW and Zodiac on its C Series, running behind on delivery guidance from the time the airplane was certified. The meltdown shouldn’t be a surprise to anyone paying close attention—or even modest attention. The Airbus problems with Pratt & Whitney and Zodiac for the A320neo and A350 were obvious by the number of airplanes stacking up at Toulouse and Hamburg, unhappy customers (notably, the vociferous Akbar Al Baker, CEO of Qatar Airways) and the candor of Airbus officials, who did nothing to downplay the issues. Although PW got nearly all the bad press for its GTF troubles, less publicized (and less impactful) were the technical problems and late deliveries of the CFM LEAP-1A. At one point, Airbus had around 100 A320neos parked without engines. CFM’s partner, Safran, has been really clear that any talk of boosting production beyond the committed 60/mo A320s is discouraged because of the pressure on producing engines at an unprecedented rate. Boeing has had its own problems as well, though far less publicized than Airbus. It was up to the media to reveal the seriousness of the Trent 1000 issues on the in-service 787s and the knock-on effect to the in-production airplanes. Only via enthusiast photos at Paine Field (787s) and Renton (737s) did the Boeing Gliders come to light. Even then, Boeing said these were inconveniences, not problems. Spirit Aerosystems missed some deliveries of its fuselages when its own supply chain fell down on the job. Following an earnings call last week, the aerospace analyst for Canaccord Genuity wrote, “While the company has largely caught up with the 15 737 fuselages that were delayed coming out of Q1/18 (~5 still running late), management indicated that there is still a lack of consistency on the program and with deliveries to Boeing (quality and sequence). Moreover, the company indicated that there are also still a handful of suppliers that are struggling. This isn’t the first time there was a supply chain meltdown at Boeing. Twenty-one years ago, in 1997, when Boeing was producing 21 737s a month on its way to 43, the company shut down the 737 and 747 lines for a month because of supply chain strain, shortages and other production issues. The snafus caused a write off of nearly $2bn and cost Ron Woodard, CEO of Boeing Commercial Airplanes, his job. Another $1bn in customer penalties was due the following year. Chart (c) 2018 Leeham News. Source: IAM 751. The Seattle Times also reported that Boeing has a labor shortage at its 737 plant, the result of a cost-cutting drive to shrink its workforce through voluntary, accelerated retirements. Boeing now has to shift personnel from other programs and recall some to deal with the backlog. 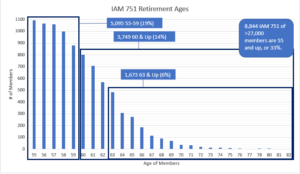 Last March, LNC analyzed the aging workforce of the IAM 751, Boeing’s touch-labor union, using data provided by 751 and concluded that 19% of the current workforce who are 751 members are aged 55-59. This is 5,095 workers. Another 3,749 were aged 60 and older—another 14% of the workforce. 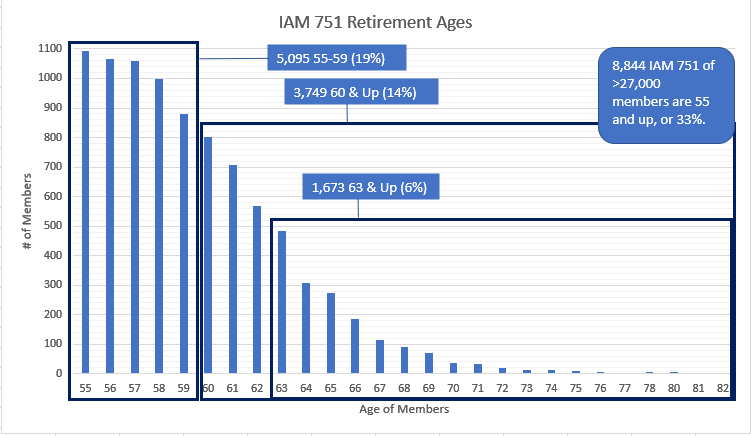 In other words, 33% of Boeing’s touch-labor workers are already retirement age. The ramifications at Airbus are well known. What the ramifications are at Boeing remains to be seen. My favorite part reading this ST article yesterday was gliders fitted with engines to be flown a few miles away to be put in temp storage only to have their engines brought back (trucks) and remounted on other planes. They have no physical space to keep’em around! But, hey, better to have issues managing growth than a depression. I am surprised Airbus don’t do the same with A380’s being worked on in HAM, they do not need 4 new engines until the last few days of work, like 3-6 moths later hence the removed “Test” engines could be trucked to Toulouse for next A380 to HAM. Dont think the A380s have their interior fitout and paint job in Hamburg anymore due to the very low production numbers. Wasnt the 380 hangar re-purposed into an new more automated A320 FAL ? Who even thought it was a good idea to have 737 interiors completed and customer delivery at another ( but very close-by) airport? Boeing Field has very limited space as well and yet Boeing had large areas of land at Renton for its now demolished 707/727 etc factories which it sold off for big box retail and malls. If they were gliders they would need a Tug Aircraft. Inresting topic. Macro problems on both sides. In the past you didn’t need statistics to see the workforce at A was significantly younger than at B. Walking around was enough. People hired in the eighties are approaching retirement ages. But time is moving on and labor is better protected in Europe. Although unions are weaker. I thing Scott and many others have been warning on engine production capacity. I saw some 787 gliders 2 weeks ago at LHR too. VS I think. Probably globally some more. Keesje: On our side of the pond I look at it as the European Unions (not EU) are more cooperative than weaker. From the results of the last go around, I would say the US Unions are about as weak as they can get. Having been a member of 3, I can tell you why. 1. Its a good old boys cludb (emphasis on boy) with an attitude that is right out of the 50s. 3. To do so, they keep upping the stakes and promising the moon when in fact they have achieved as reasonably economic objects as they can get. Much like Agent Orange, all show and no go appealing to the slobbering minority at the expense of the good of the all. 4. 10% should down the 90% – most people don’t want any hassle and let it happen. 5. They have no vision and they don’t recruit. Occasionally a guy of vision does come along and they don’t support the group they recruit. The vision guy doesn’t last long. 6. Nothing like NTSB with a purview to examine and report on the Union books. Various shenanigans (and worse) as we have all see occur under the cover of darkness. Interesting topic. Macro problems on both sides. In the past you didn’t need statistics to see the workforce at A was significantly younger than at B. Walking around was enough. But people hired by A in the late eighties boom are approaching retirement ages. Time is moving on and labor is better protected in Europe. Although unions are weaker. B probably has a different cycle. Are there skilled flex workers that will go anywhere if you pay enough? In MRO you used to have them.. Brits mostly if I remember correctly. Apparently during the coldwar RAF trained many thoroughly and they had the language advantage..
@jbeeko The supply chains are basically the same but there are different parts between the engines. The answer to your second question would be no. While the sources are the same the parts themselves are not. Physical size difference ranges from 56 to 81 inches. The E and MRJ engine have no weight listed. So while its a common concept, various versions are doing to have totally different dimensions. With a supply chain you would take months to change from one type of engine to the other and the A320 still has much larger allocation due to the production being much larger than the C.
So no you can’t sub engines across. Could we see more larger aircraft on shorter haul routes in the long term. Airport, air space congestion, also building a larger aircraft, including engines. An OEM’s “seat supply” to airlines could be be more per year although less units are produced, A321 vs A320 for example. Possibly a good case for Boeing’s NMA with new production processes, quick turn around times of a “small” twin aisle, etc. Definition of seat capacity vs range remains a head scratcher. By “larger aircraft” you mean from narrow body to wide body? I think in most cases it’s more likely they’ll upgage within the same class. For instance go from A319 or A320 to an A321, and from a 737-700 and -800 to a MAX 8, 9 or 10. Though there are signs of what you talk about. British Airways uses a B767-300ER on some morning flight from LHR to AMS, but that’s on (probably) the most slot constrained airport in the world (LHR) to another airport (AMS) where it’s impossible to get a slot at a decent time (unless you buy it from another airline). LHR slots can go for tens of millions (I think the highest paid price for a pair was 75 million), which makes adding flights extremely expensive for an airline. Mainly single aisles, 320–>320+, 321–>321+, 320–>321 etc. If the “797” is an ~240 seat aircraft with ~4500Nm effective range it could be a very handy aircraft for short to medium haul. Planing and de-planing of a twin a major advantage on shorter missions. The 787’s are there for longer haul (and cargo) missions. AB has no real competition for the 797 in this form. With engine supplies becoming an issue maybe could see an A220-500 sooner than expected? The NMA is difficult, especially for BA, because as they don’t have a good large SA. However believe there is a good long term market for an aircraft between the A321 and 789 in range and capacity. Also in the east, there is the C919/MC21 and C929 and nothing in between. The A338 has an OEW of 132T compared to the 788 (120T) and 763 (90T) for example and is not the answer to serve high density short-medium haul routes (1000-5000Nm). The 787-8 has had the rear fuselage made common with the 9 and 10. It may not be dead and future may have it become more common as orders are still coming in. We are already seeing the strains of PFS 3.0 which Boeing is rolling out to their supply chain this year. Too many cost cutting initiatives in rapid succession meant every supplier had to scale down instead of ramp up for the rate increase for those suppliers that could survive and outright acquisitions for those who couldn’t. Now Spirit and Boeing are stealing qualified CNC operators from their own supply chain, which is nothing new, but compacting the problems that scaling down warehouse spaces/inventory/headcounts for cost savings and failures to prepare for the increased build rates across the entire supply chain already caused. Add in the looming potential for raw material shortages due to sanctions and Boeing will have no choice but to be relieved when all the orders for 737s for Iran get… pushed to the right. And if the news reports about Jet Airways are true (that it has about 60 days to live), the ~250 firm/MOU orders for the MAX (~5% of the backlog) also go away. About Jet Airways. From what I’ve read the past days it seems like Jet Airways is making it seem like it’s just a way to get to a deal for salary cuts with the employees faster, and they spcifically mention the pilot union. But why would the pilots agree to a salary cut if worldwide there’s a huge demand for pilots? Sounds like a good opportunity to get out of your contract (that you as a pilot probably signed when opportunities were scarce). Is it easier to outomate an CFRP fuselage or “Metal” fuselage production? At what point will wing supply become an issue/bottle neck? How come it takes someone taking pictures of the fields to get this story, where is the Press? And seeing as how Boeing has 40 or so x 737 parked, does that not put about 40% of the glider issue at Airbus on CFM? Quite a lot of that has to do with the new fuselage for the MAX and having to hire more people to make it as its not the same as the CEO. @TW, in my case I live across a body of water, a ferry ride and an hour away from Boeing Field. Everett is even longer. Not exactly on my beaten path. Can’t speak to other media. Ahh, but you should have our spies and sources of information. Maybe when I retire I can come down and build a network? No need to hire spies if the following web pages are accurate or close to it. Status of non-delivered 737 MAX’s at mid-day 8-13-18 according to the link after the status list. Re-work: 1 (737-9 test aircraft #2). Re-work engines removed: 1 (737-8 test aircraft #3). According to the combined information at the two links below, July 737 deliveries were as follows. We shall find out tomorrow how this data compares to Boeing’s official July deliveries report. Deliveries for LN 7001 and up can can be found at this link. This link shows 8 additional July deliveries for aircraft with line numbers below 7000. Boeing’s official delivery numbers for July 2018 appeared as scheduled on their website today (8-14). Boeing’s official 737 delivery tally for July 2018 is 29 vs. the tally of 34 that I calculated from the websites that I mentioned above. Maybe this is due to official delivery dates being different than the delivery flight dates that are easiest for an external observer to monitor? Here are Boeing’s official 737 monthly delivery tallies for 2018. Bombardier can own the A220-100 and the A220-300; or Airbus Corporation can own these planes; or they can own them together but it makes little impact on the fact that they can only build about two a month for the foreseeable future. This is because Pratt can only send them about 4 engines a month. Why? The MBA degree carries more weight than the engineering degree. Who cares about proper staffing and labor when there’s opportunities to be had in Low Cost Countries (LCC?) This acronym, LCC, I first saw in a major aforementioned first tier aerospace supplier. I was told a certain percentage of jobs had to be sent to a LCC. I then said what do those guys over there do? I was then told they fix the things designed and manufactured in India. While Boeing gets rightfully “kicked in the head” in the lead of this article, Rolls Royce, at least in my mind, still gets the blackest of “black eyes” (to mix metaphors)! What airline exec, in his right mind, will EVER order a new RR turbofan going forward? I predicted, several months ago, RR would bust the equivalent of a billion US$ on this Trent fiasco. Scott raised the issue a couple of months ago of “shades of the RB211” (bankruptcy event). Management bleats on and on about a future (possibility?) of massive free cash flow. I just read yesterday that a U.K. financial analyst marveled that a twelve pound share RR stock should be trading about two pounds per share in reality. Shades of Enron, before the fall? (Or is the Takata airbag financial disaster the more apt comparison?) Does anyone know the “endgame” here with RR? And, lastly, does LATAM still have all six of its 87-8s still sitting in Victorville for RR engine swaps/repairs? Strangely airline execs are buying Airbus dual aisles by the dozen- all powered by RR the exclusively. Would it matter if anyone pointed out that the cracking on the finishing of the intermediate blades are mostly on two blocks of 787’s? The early block engines are fine, but are checked anyway. RR should have left well alone and not altered the recipe. No problems encountered on the Airbus fleet (so far). Are the RR engines blowing up in the sky like those of CFM on the 737 or GE on the 767 or PW on the 777 or GP on the 380? GE has had issues with the 787 GEnx engines too. Dukefurl: I guess I need to remind you about the Qantas A380 whose engine not only blew up but almost took out a wing and the incredibly close call that engendered? So you dredge up old history to make this look better for RR? But like Agent Orange, just attack. Maybe you can hide the debacle in the ensuing dustup. There is enough observable interaction around that would indicate that GE has “interested proactive supporters”. Just look at the A.net topic AF66 rapid engine disassembly”. though an Engine Alliance issue it instantly turned into an RR bashing spree. this is not the only media interaction that seems to show pronounced attacks on RR and protective brick walling to the benefit of GE. unsolved afaics is : who pushes this is it a general US media and astroturfing drive or is GE specifically involved? I have been following this form some time and have gotten some real blow back on comments. Airbus nor Boeing can do anything about certain supply situations and the ones they ran into are those. P&W and CFM are into what I call teething issues and I can have sympathy for that . RR has taken it to a whole new level. They have always been snooty about the vaunted 3 shaft when GE has been doing two shaft that are slightly better SFC with equally good on wing time. And not to understand their flow paths that caused the second problem? So what to they do, they fire a whole bunch of people in the middle of a crisis and the stock shoots up. Amazing how the worlds business works. No wonder we are in trouble. Just fire some people and it doesn’t matter if your product is a piece of rotten fruit . “With a high by-pass ratio engine of the triple spool configuration, a further significant improvement in specific weight is obtained. The answer is -lower weight, reduction in parts, less stages (shorter). Doesnt sound snooty to me? And how does GE achieve its ‘numbers’ for its large fans? They use variable stator vanes and more stages, which is more complex and heavier, but it works. that patent covers using multiple IP turbine stages rather than 1 for the purpose of lowering work per turbine stage. hard to believe that in 2009 they can patent using more than one turbine stage on an IP turbine when multiple turbine stages as a way to reduce work/extract more energy when that method has been around on turbines in general for 50+ years. the phrase “obvious to a skilled practitioner” is operative here and should have prevented this patent from being issued. There were older claims in the middle sixties of RR for ‘discoveries’ which included the 3 shaft layout. I think that particular ‘ first discovery’ has expired but likely they have later ones with small changes to effectively extent the life of their patent. You can only have an ‘IP turbine’ if you have a 3 shaft layout. Intermediate means between higher and lower. A skilled reader could have picked that one out. I know very well what an IP turbine is. 3 shaft engines have been around for a very long time and I’m not a moron. If airlines select mostly GE engines in future to power the 787’s will GE be able to supply enough engines with BA targeting an output of 14/month? This on the other hand could loosen up capacity for RR to increase production of XWB’s for the A350’s. I doubt you work in an industry that has snoot. In mine its Cat, good product for the most part, some gross failures, nothing better than say Cummins, Perkins and a host of others. When a two spool design consistently beats a 3 spool, then either your 3 spool engineers don’t understand the merits and can extract the advantage, or much like open Root that on paper looks wonderful but in reality is not, the 3 spool just does not cut it. Its kind of like watching a sports team that the expert laud so highly the players thing that they just have to show up and then get their butts kicked. My take is RR has been partaking of its own Purple Coolaid (to mix a lot of metaphor). The bulldozing and salting will take care of itself if they don’t get their act together. P&W was on the verge of irrelevant as well, now they are back in the mix. We have to see where RR goes, but from what I see, the bad news is not over. Trent 10 and the 7000 both have common heritage to the 1000 and that interior flow core 25% can be a killer. And not I don’t dismiss the issues of others and you should not that I was all for stopping all PW flights when they had the seal issue until they could fly an aircraft with two known good engines. I don’t buy that bit about well one is suspect but the others is fine. When someone says yes, our engines cost more, but they have better SFC and pay back those costs for more complexity, and it does not happen twice now, then yea, I call that snoot. Now we hear that short haul is the 3 spool domain in SFC when it used to be long haul. diesel engines makes you an expert on the intricacies ( outside of what is published)of big fan engines? There is roughly a 15 year +gap between the 1000 and the 10 which had the Trent XWB in between, no surprise then that the T10 incorporates a lot of XWB tech in it. Same goes for the T7000 for the A330 neo it incorporates new tech from XWB and T 10 into its core architecture. A similar situation occured for GE on the 777. It was 10 years after the first 777-200 flew that the 777-300ER with sole source GE90-115 first flew. Obviously for a HGW plane they needed much more thrust than their earlier model which was delivered, with a jump in overall pressure ratio, bypass ratio and fan diameter( with new curved fan blades too). It paid off as the new engine played a big part in the 777-300ER family ( includes 777F )success. Duke: As noted, you clearly don’t actually work in an industry like I do. In fact diesel engines (and various gas types) have become extremely sophisticated and always were in their fuel injection systems. Ever hear of a Turbo compound? Mechanics cross all horizons, a jet engine is nothing more than a fancier turbo charger. Machinery is machinery though I expect you won’t get it. When history is written, this is going to do down as one of the worst industrial offerings. In the US we would compare it to the Edsel. Probably over there it would be Neville Chamberlain and peace in our time (or Lucas if you are familiar with them, known over here and there as well I believe as “Prince of Darkness”. Still haven’t come up with a totally failed modern engine have you? And you might keep in mind RR (or used to) have a diesel division. More to it than you realize. Contrary to the precious remarks by another poster, the PIP A was not fine, it failed fuel SFC miserably and ALL were upgraded to the B and then C.
And the 900 has blade issues as well. Not the poster child for good work. Unless its in how not to do it. I hope suppliers will get everything in order for the a320 and 737 series to get to 150 units a month. One of the problems of the ramp-up of plane production is this: At the same time Boeing is making big, big money, as everybody is making lots of money, Boeing has gone to the supply chain and said: Make it cheaper. So when vendors are pitted against vendors, they start looking at other sources for parts and materials. Now with new suppliers through-out the whole system, they’re told they want it “yesterday” in bigger quantities, lighter and with greater technology. It’s like Boeing wants to replicate the B787 development and early production debacle to validate a certain group think. Let me sip from your profits…. or else. Gee. It took me ten lines to say what you said in two. I’m going to work on being succinct. 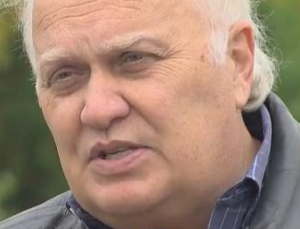 It is dangerous for Boeing to press suppliers for reduced pricing and asking them to invest and increase staffing to increase deliveries at the same time while they know Boeing will later be back asking for another price reduction. Current 320/1NEO backlog at ~5800 (CEO’s still ~300), at 700 units/year (realistic) that’s more than 8 years production (without any new orders), the “B797” could be in service by then. On the other hand the bottom could fall off some big orders for both the A320’s and 737’s? RR is in problems. But just like on Boeing “the” press is turning a blind eye on GE too. The GE stock value keeps collapsing, the many GENx upgrades and missed sfc’s would mean “immature” engine for others, even after the nearly 4 yrs 787 delay. The GE9X backlog stalls and the LEAP apparently isn’t all party material either. But CFM/ GE is a powerhouse and household name, so even independent press is “conservative” reporting trouble they see. You don’t make friends reporting champs having glitches. You need friends to sell your work / get info and readers want to be confirmed, not have their believes / stock challenged. There is no question that RR and GE overpro9mised on the 787. Both had pips, GE came out better and has done hugely better as there have not been the RR blade corrosion or the blades breaking. They did have a problem with super cooled water droplets in the engine. That I call an unknown that can bite anyone. GE follows an architecture that made it enough of a problem to manifest. I don’t call that any different than the fuel cooler in the RR engines on the 777 that bit them going into London. Those are new manifestations. Global warming, too optimized design, luck of the draw. Blades that can’t tolerate Salt water area flying? What does a 787 do but fly over and to destinations of sale water? Blades cracking and not even understanding the flow path dynamics? That should be a 050 level class in engines (ie not even a basic 100 level class) . When you see that, you have to wonder if its endemic and are the associated family members affected? I challenge anyone to remember when an engine mfg dropped an engine family like RR did and came out with an all new engine to replace it! Quote:” I challenge anyone to remember when an engine mfg dropped an engine family like RR did and came out with an all new engine to replace it! Your “challenge” is ridiculous as it is based on a false and distorted assertion. Whatever your agenda, the fact of the matter is that RR has not “dropped” the Trent-1000 family. The Trent 1000-TEN is not an “all new engine” as you’re falsely claiming. It has 25 percent parts commonality with the Trent 1000 Package C.
The 787 rollout was in 2007 (as a potemkin plane) but now has its potential in its bigger version the 787-10, which is 10 years later with a new Trent 10 engine version where RR took some of its new technologies from its new Trent XWB for the A350. GE did much the same withs its engine for the B777-300ER family. Having a mild makeover of its existing 777 engine wouldnt have worked. Its point less in the large turbofan sector to develop new technologies and save them in the cupboard for later. The reason why GE didnt have a newer version of its GEnx for the 787-10 is that it wasnt selected for the A350 and its newest engine for the 777X is still in development. A similar situation occurred for GE with the Embraer E2 series, it wasnt selected so didnt build a ‘new gen’ CF34 based on the Leap tech. The Trent 10 was designed well before the Ten was announced. RR saw the written on the wall even if they didn’t see the flow patch issues on the simulations and what passes for testing. 10: First run 2010 (so you want to guess when the design started? Like 2006! They saw the train wreck a coming. ala they knew they 1000 would never meet the specs. They didn’t know it would melt down so miserably as well (nor why the blades cracked until this year). OV099: In the real world its an all new engine. I stand by the listing. All he footo chop brochures aside, test articles aside, first run is when an engine in its production configuration runs. Of course you have be be something more than a desk type or Alex Jones type to know these things. 1000: he first run of the Trent 1000 was on 14 February 2006. First flight on Rolls-Royce’s own flying testbed (a modified Boeing 747-200) was successfully performed on 18 June 2007 from TSTC Waco Airport. The engine received joint certification from the FAA and EASA on 7 August 2007 (7-8-7 in Europe). TEN: The engine first ran in mid-2014. Rolls-Royce initially hoped to certify the Trent TEN before the end of 2015, and to enter service in late 2016. Revising a weight-saving feature called ‘banded stators’ and other design issues delayed FAA Part 33 engine certification. It was certified by the EASA in July 2016. As an engine takes 5 yeas at best, two years into production of the Trent 1000 (or sooner) they knew it was hopeless. Call it the Hopeless Diamond maybe and then went on to do another hopeless diamonds (UK seems big on crown jewel thing) . Its a shame Scott can’t hold bets, the Ten and the 7000 are going to be affected as well though they may be able to intervene in time to keep it out of the public domain. I really think some of it is probably related to politics driving people mad, but it is amusing. Again, un-noted elsewhere in the comments, or reporting here; massive free cash flow. It’s not exactly killing Boeing, to the extent they are participating in these great conspiracies/capers. I hope you are not channeling Alex Jones or Uwe now! I think something to note in Boeings push for automation. Downsizing jobs from automation only pushes out younger union members and not the senior ones (unless the senior employees are too stubborn to change). VLO’s aren’t attractive to retirement age employees either with the insanely rising cost of living in the puget sound as well. I would presume any gap in labor created by artificial demand reduction and VLO’s would created further issues with transitioning the older workforce to a younger one. £2 billion for the Trent 1000 ,this is probably conservative. I have yet to read any numbers for the GTF,they must be immense. I would guess more like 500 million for GTF. Much smaller engine. Vastly less serious problems. Biggest issue is deliveries to Airbus and or BBD as opposed to spares to support in field ops. Oddly, RR does not seem to be affecting TEN deliveries so it may be they are just too bad on the 1000 Owners. You get your engine when we are done with our Tea! Looks like the 737 bottle necks will continue to at least for the remainder of the year? The more I look at (“new”) engine issues won’t be surprized if BA drops the NMA/797 and launch an FSA/NSA of 757-200 in size, 40-45m folding wing, Al-Li fuselage with outomated production, and using CFM’s/P1100G’s with PIP’s (35-37Klb?). Could catch AB with their pants down, just need to give the 788 some tweaks/updates with lower MTOW, etc. AB won’t have anything to respond on the TA front, the OEW of the 338 for example 12T more than that of the 788. The “reign” of the 321 could come to an end. With the 321+/322/321XLR AB is moving into “band aid” territory? If I was on the BA board know where I will put my money. It’s 12T from the info I have seen, 338 OEW 132T and 788 OEW of 120T. The 330-200 is/was ~121T, the T7000s add ~3T compared to the T700’s, no clue where the rest of the weight comes from. What would the OEW for 788 789 be in a similar layout? Why cant Airbus makes changes to its A321 to match any new Boeing model ? They had much simpler changes to make the A320/321 neo. Just swap the engine. Boeing had to extend the undercarriage, reloft the rear fuselage, add some fly by wire ailerons, change the wing and pylon to lift the engine further forward of the leading edge. Oh and GE had to redesign its Leap-B version with a smaller diameter core – not just a smaller fan to its Leap-A version. Aibus could easily bring in a new carbon fibre wing for a lengthened A321, all with existing engines. AB could make an 321 good in the form of an A321XLR/321+/322/etc. But and NSA/FSA will have a new fuselage, CFRP wing, etc. The same situation as A330NEO vs B787 could happen with 321X vs Boeing-NSA, and we know what the sales stats tell. If BA launches a New Single Aisle AB will have to catch up two aircraft families, will take 15-20 years to catch up? In the mean time new aircraft such as the C919, MC21 and now C929 are started to surface from China/Russia. And who is to blame, I think the A380? What I am trying to get to, Boeing doesn’t need to build an NMA. Maybe after the NSA they can do the “real” Supersonic Cruiser. Dukeofurl mentioned about adding a new carbon fibre wing to a lengthened A321 which are two things the A330neo wasn’t given. So you can’t really make such a comparison between the two. (In hindsight, Airbus may have done well with the original new wing/engine version of the A350). Now, if we take that further and apply the same level of engine technology the NMA is to receive to the rewinged A321, we might have something competitive here. After all, some people would like to draw a point that the rewinged, re-engined and lengthened 777X is still beating the all-new A350-1000 despite the lack of a comparably modern fuselage. I believe it has been mentioned that at smaller sizes, a carbon fibre fuselage doesn’t offer that much savings over traditional materials to justify the extra costs. The 777X has an Al-Li alloy fuselage, new CFRP wing and what looks like a potentially good engine. You should however compare the 35K and 778 (~365 seats), don’t think the 778 stands a chance against the 35K in sector cost and seat mile cost. Also see the range of the 35K is now 8400Nm and 8700Nm for the 778, the way AB and BA quote range are however different but there is not much in it. AB launched the 350 in 2006, that’s 12 years ago, so when and what will AB’s next clean sheet aircraft be? Can see a new CFRP wing give the 320/1’s another 15 years of life say to 2035 but what are they doing in the 220-280 seat TA market. Personally I believe they should have been busy with it right know with EIS 2025-2028 followed by an FSA/NSA. The best that can happen to AB is that Boeing launch an NMA and not NSA.